Although purchasing chairs for little tots in a preschool classroom may seem like a simple task, the truth is that there is much more to preschool chairs than meets the eye. Color, material and mobility are just some of the factors that need to be taken into account when planning preschool furniture purchases. Gross motor skills in children ages 3-5 are still very much in the development stage. That's why they tend to trip, fall and be generally clumsier than older children. So when your budding students go down with a bang, you want to make sure that their chairs stay intact. Therefore, when choosing preschool furniture, the first thing to look for in a school chair is durability. 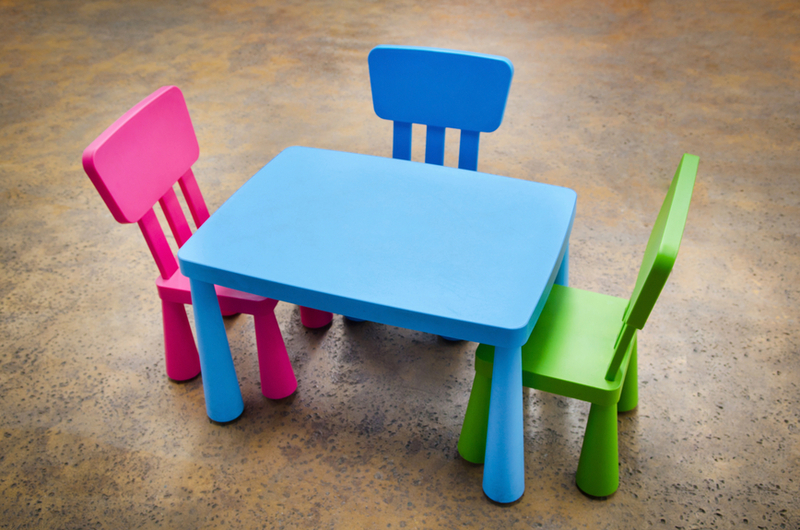 Although logic might seem to dictate that hard plastic be the material of choice for preschool chairs, soft plastic is a far more popular choice. The bodies of children are not yet fully developed (that's why they're so soft and cuddly! ), and they find it extremely uncomfortable to sit in chairs that are too rigid. So look for chairs made of top-quality soft plastic. These will give your budding students the comfort they need, while still providing you with the sturdiness you want. Some school chairs come with a plastic back and seat, but metal frames and legs for added strength and support. These are great for durability, but bear in mind that really little tots - like 3 year olds - might stick their fingers into the space between the metal and plastic and get them pinched or even stuck. If that's a concern for you, look for soft plastic chairs made of one piece, solid construction, as these will have no spaces for curious little fingers. They are much less expensive, too, so if you're operating under real budget constraints this might be your answer. If you're looking for the strength of the metal-plastic combination but want the safety of a one-piece unit, you might want to try a school chair made of a mixture of soft and hard plastic. These chairs are made of a one-piece, soft plastic shell (the back and seat) that is ultrasonically welded to a hard plastic base. They are a bit more expensive than the standard soft plastic preschool chair, but cost significantly less than a metal-plastic combo. A major consideration in preschool chairs is their "stackability." Most preschool classrooms, as well as many kindergartens, are multi-purpose. The same general areas are often used for such varying activities as circle time, story time, arts and crafts, snack and lunchtime, rhythm and music and even naptime. This means that when planning school furniture for preschool-K, having chairs that can be moved and stored easily is a real necessity. So look for chairs that stack easily, and that can be stacked in quantity. Some preschool chairs can be stacked as much as twelve-high with no trouble at all. Make sure that they can be pushed or pulled easily, as well. This is especially important with slightly older preschool children, who will be expected to clear away the chairs when it's their turn to be the helpers on duty. Now that you've got school chairs with the right height, strength and mobility, it's time to choose your colors. Most preschool chairs come in a variety of colors. If the children in your preschool have assigned chairs, you might want to consider buying chairs in a multitude of colors, to make it easier for each child to find her personal chair. Keep in mind, though, that if the rest of the room is equally colorful, the net effect might be a bit dizzying to the eye. If you have a number of preschool classes in the same structure, purchasing a different color chair for each class will help keep things orderly. Everyone, including the children, will know that the 3 year old class has red chairs, the 4 year olds yellow, the 5 year olds green and the kindergarten blue. This makes it easy to return stray chairs to their proper classrooms. If you're looking for classic, color-coordinated furniture that won't make your preschool classroom look too busy, Educational Edge furniture has an entire color-coordinated line, from chairs to cubbies to bookcases. While the price is not significantly higher than standard preschool furniture, the aesthetic impact is, so you might want to check it out. If you have any further questions or you'd like assistance in finding preschool chairs and preschool tables that will best suit your needs, feel free to contact a Hertz Furniture expert at 888-793-4999, or by chat between 9am-5pm Eastern Standard time.